I was recently skimming the Internet looking for people who like me when I came upon something that truly startled me. It appears there's a rumor going around that I don't exist, and it seems to have started somewhere on this very website. 1) I do in fact exist. I have existed for some time. 2) For a brief period in the eighties I did not exist, but then I existed again for a reunion tour (1984 I believe? The Victory Tour?). 3) Also, despite my reclusive nature, I did in fact exist all through the nineties, writing romance novels under the name Cindy McNooga: "The Blossoms of Fire"; "The Fires of Blossom"; and "Touch Me There, William". Herein is where I believe the confusion to lie: throughout the 1970s alone, there were in fact over 12 different Titos cycled in a constant rotation. When the need arose, a new Tito was simply thawed and unfrozen while the next was put into stasis. In a very real sense, the Tito unit was not only the guitarist extraordinare, but also the functioning "bullet-taker" for the Jacksons, devised in a brainstorming session at Motown records. In theory, Tito's hair (or "fro") would be able to withstand a severe barrage of small arms fire, over 3 tons of pressure per square inch, and other such detriments including, but not limited to, certain forms of biological warfare. I myself was Tito-12B. And, as mentioned, the Tito line was not only built to endure all manner of offensive assault, but play one funky mother-f*ckin' bad guitar. And I mean baaad. Ye-ah. To purchase Tito, please contact Motown records care of Universal Music Group. 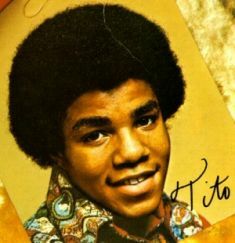 For a low onetime payment of only $3.99 plus $4.99 shipping and handling, Tito Jackson can be yours! Your very own Tito Jackson will arrive in 6-8 weeks. I look forward to funkily protecting you... brother. Please come see my reunion concert at Madison Square Garden. It's going to include every Jackson brother but Michael; don't worry, we'll make up for it by tossing in a few Wayans brothers.